HOME - Santa Fe Athletic Co.
Our group strength & conditioning classes utilize a wide range of modern and traditional fitness modalities. Each class is designed to challenge every aspect of fitness – endurance, strength, balance, mobility, agility & cardio endurance. With our experienced and knowledgeable instructors, each and every class can be modified for all fitness levels, ultimately meeting any of your unique needs and pushing you to meet your fitness goals. Our certified yoga instructors will take you through traditional flows, strength based or restorative practices. We pride ourselves in a unique and innovative offering of custom classes created by our experienced instructors. Among these cutting-edge classes are TRX Core Sculpt (a blend of TRX, Yoga and Pilates inspired movements) and soon to be announced, creative specialty classes such as a Sunday Funday Dosha & Mimosa class! Our FTC is equipped with a 6 squat station rig, rubber plates, dumbbells, rings, battle ropes, tires, slides, Concept2 rower & skier and more. Our new equipment and space is great for WODs, weight lifting, cross training, powerlifting, or any other workout regimen you currently follow. It’s also ideal for Sports Performance Training and personal training, please contact us directly for monthly memberships or for more information. ABOUT SANTA FE ATHLETIC CO. 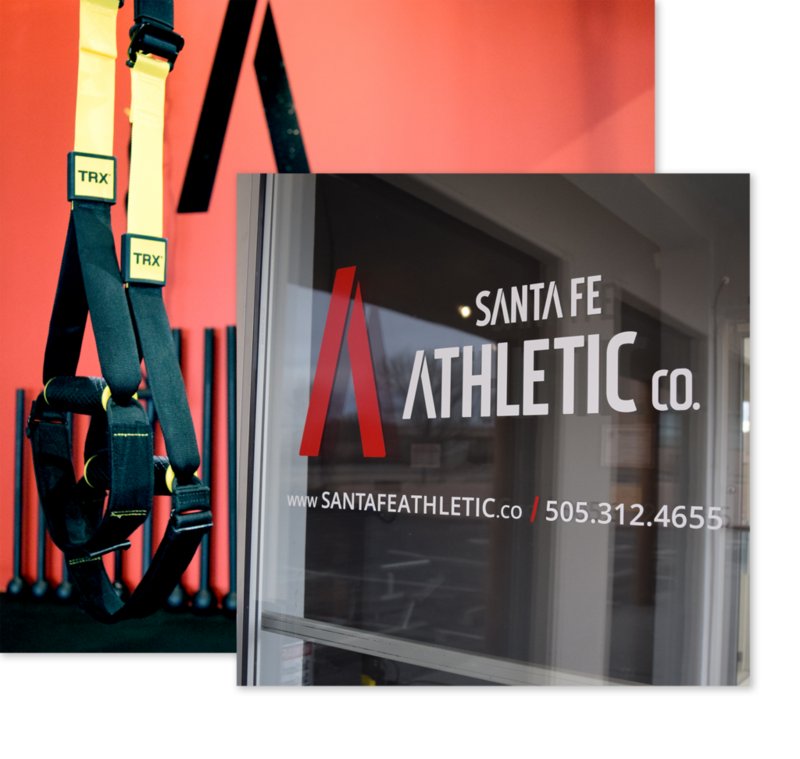 Founded in 2019, Santa Fe Athletic Co. is a functional training center locally owned and operated by native Santa Feans. We strive to provide a community environment made up of people of all fitness levels. Our unique space brings together a diverse collection of fitness modalities that compliment each other, offering an unparalleled fitness experience where we can Train for Today. "I loved this class! David’s instruction technique is very thorough and he pushes you to challenge yourself - not to mention the facility is awesome! It’s exactly what Santa Fe was lacking." "Dasha’s class is amazing! Challenging moves done in a tranquil, gorgeous space with excellent mood lighting. Classmates with various levels of practice in a supportive, non-judgmental space. And with great beats to boot. Total dopeness!" "I love David’s Mega Circuit strength training class! It’s the total body workout you need to push yourself to the next level, especially when you’re in kind of a rut in your normal gym routine. It’s intense, but he always provides multiple levels for each exercise whether it’s to ease it up or to challenge you! The space is modern and has a welcoming environment." "This space is so awesome! I love all the different types of classes they offer and all the instructors are amazing! I never fill intimidated walking into a new class and I just think it's a great place to get your workout in!" TAKE A LOOK INSIDE OUR SPACE! © 2019 Santa Fe Athletic Co. All rights reserved.